When I saw this site, I just wished I will get married again (with the same person of course!). 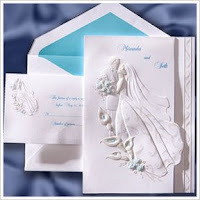 I kept browsing and I was captivated by the bride and groom Wedding Invitations with Blue Lilies and the Happy Couple Design. I always love the shades of blue or aqua accented with floral designs. Of course, for me it is always attractive to have the bride and groom embossed design on the front cover of the invite, and at the same time it looks elegant. That was the reason why my wedding motiff was powder blue. It does not hurt the eyes when seeing it and it's a cool color. I think calla lilies and roses are perfect combination in an aqua accented background. I mean, this design itself is perfect. A trifold is actually the best for a wedding invitation, particularly if the entourage is kinda large. But if this will be my wedding invitation, I would add some personalization by adding our actual photo on the bride and groom's face on the embossed design, plus a scented paper should be used in the inner side of it. Now, I think that would be considered unique. Hhmmmm, maybe we can use this on our golden wedding anniversary?? :)). That would be...gosh! I would be 90 years old?LOL!...who knows, if God will still allow me to be alive and kicking, why not? :). I bookmarked the site. You might want to visit it and see it for yourself.